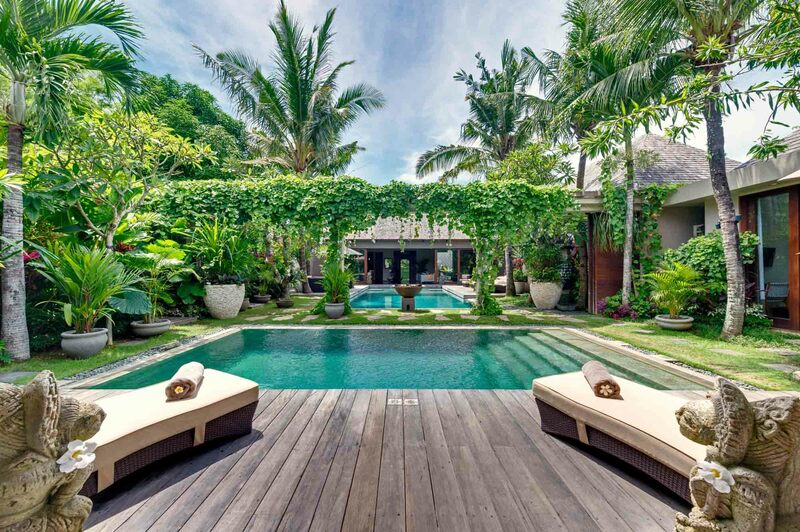 Seminyak may be bustling with trendy shops, spas and eateries, but families and friends will find an oasis of calm at The Orchard House, a spacious and serene 4-bedroom luxury hideaway tucked away down a small lane just steps from Seminyak’s main attractions. The owners, Luli and Charles Orchard, are renowned designers, and they have created a comfortable family home that oozes character and charm and offers plenty of inviting indoor and outdoor living spaces. 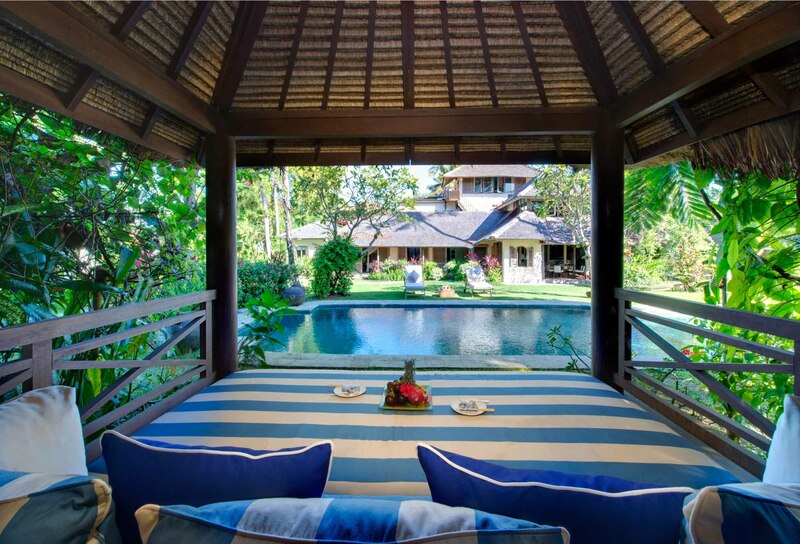 The Orchard House is set in the midst of an expansive garden with winding paths, a manicured green lawn, mature trees, tropical flowers and a 13-metre swimming pool. 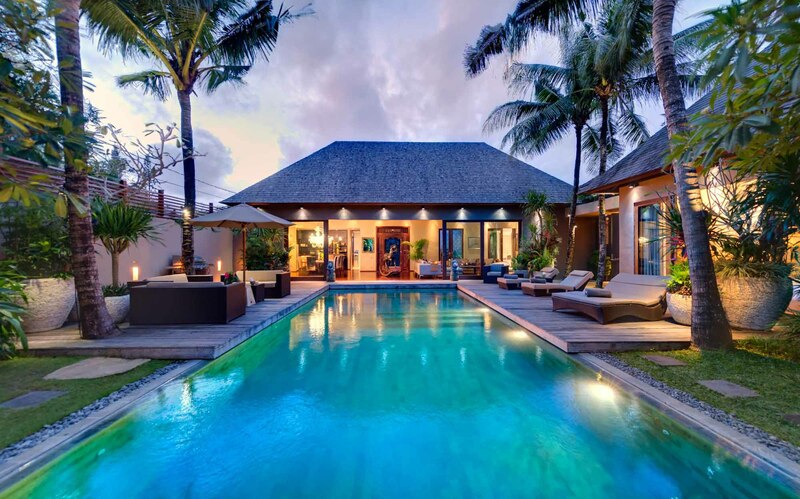 The villa itself was designed to blend into the natural environment, so local materials were used throughout including ironwood shingles, alang-alang thatched roofs, natural stone and wood. 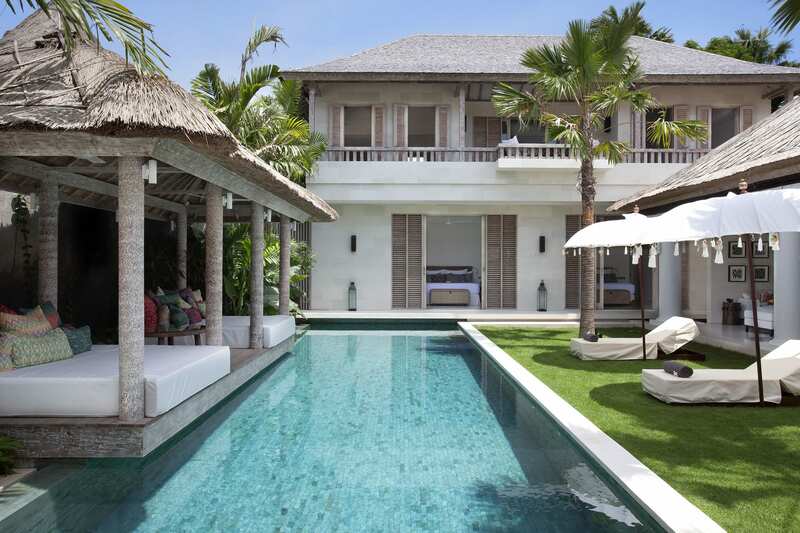 However, the villa is also reminiscent of a grand colonial estate with shuttered windows and French doors that allow breezes and natural light to pour in, and an eclectic mix of exotic antiques, artworks and rich furnishings. 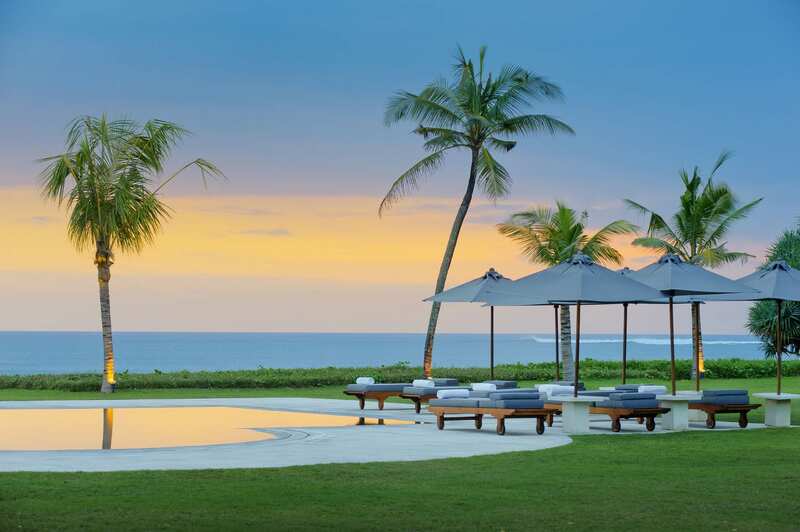 You can choose to spend your days here relaxing next to the pool, dining outdoors on the terrace, indulging in Balinese massages in the open-air bale next to the pool, catching up on your reading in the rooftop library, or watching the latest movies in the air-conditioned media room. 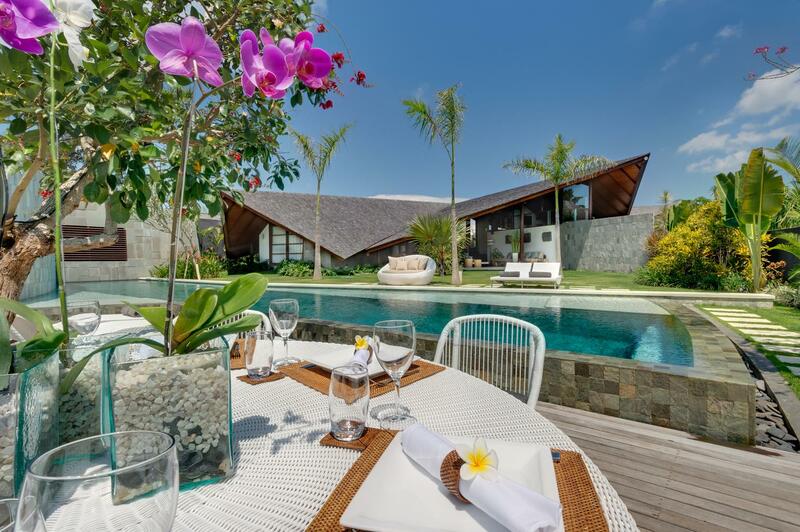 However, part of the appeal of The Orchard House is its fabulous location just minutes from Seminyak’s hottest and most happening beach clubs, restaurants, bars and boutiques, so you’ll definitely want to set aside a few days to explore the neighbourhood. On the ground floor of the main building at The Orchard House, you’ll find the open-plan living and dining room with large sofas, a dining table for 6 people and a writing desk with a computer and printer. Take a few steps down and you reach the ‘Big Room’ with its high ceilings, oriental carpets, sofas, book shelves and a TV, DVD player and Bose iPod dock. Just steps from the living room and dining room you will also find the fully equipped kitchen with a cozy breakfast nook and the media room with its flat screen TV and DVD player, karaoke machine and kid’s toys. To get to the master bedroom, take the stairs next to the entrance hall to the second floor. 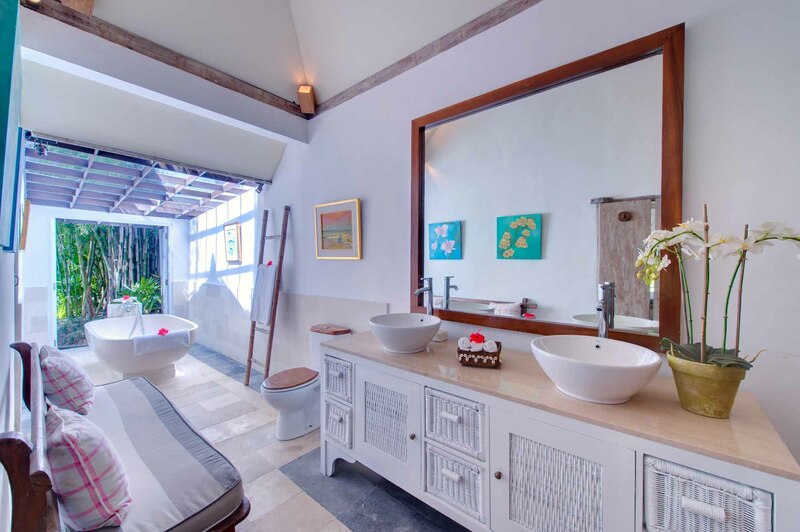 The master bedroom is spacious and bright and features hardwood floors, a king-sized bed, TV, DVD player and an ensuite bathroom with a dressing area, antique carpets and Palimanan bathtub. Off the dressing area from the master bedroom, you can access the children’s room with its two separate nooks, one with bunk beds and another with two single beds. 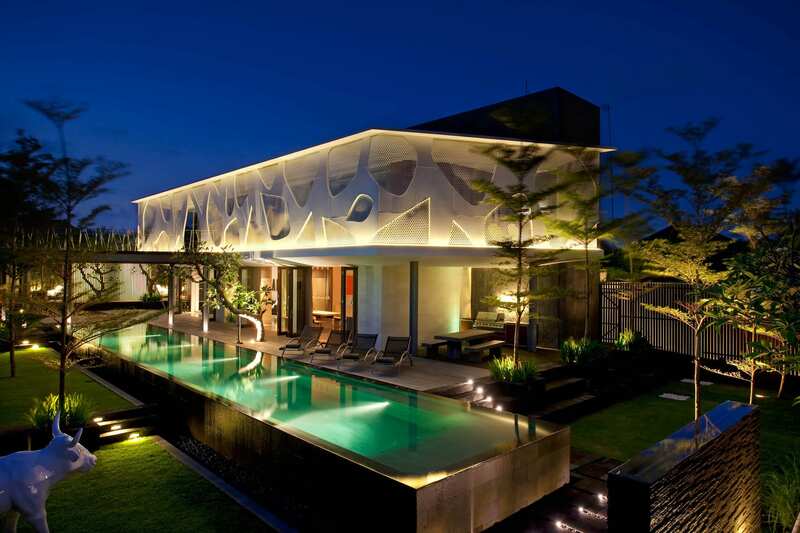 Another set of stairs leads up to the rooftop library that offers views over the garden and neighbouring rooftops. On the ground floor there are two guest rooms that can be accessed from the garden patio or the media room. 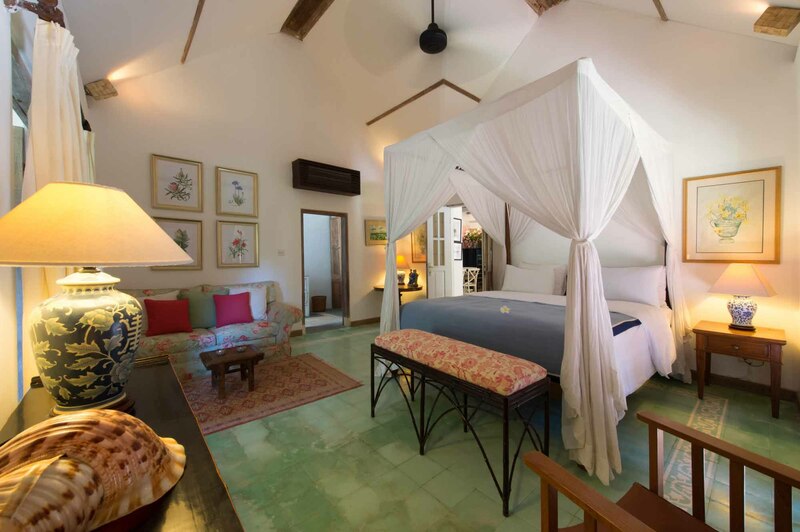 The rooms are decked out in green and white tiles, and one room features a king-sized bed, while the other has two twin beds. 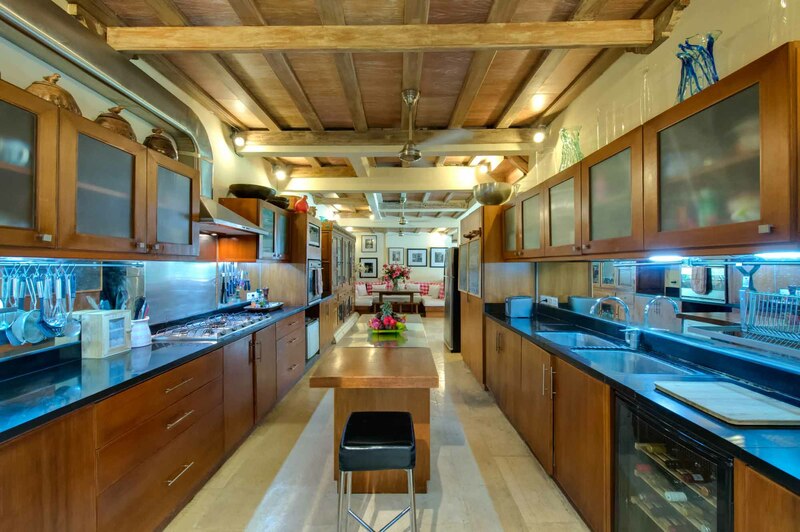 These rooms connect via a door, and they share an ensuite bathroom with a shower, marble vanity and a large terrazzo bathtub resting under a glass ceiling. 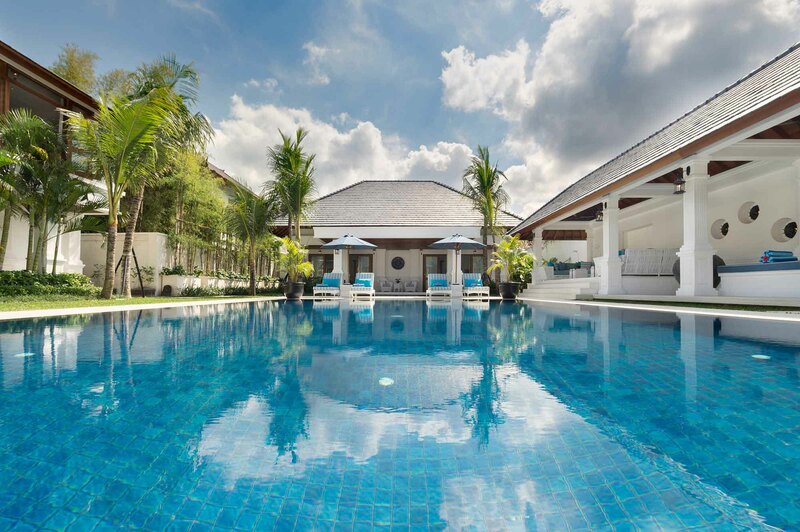 Outside you will find the gorgeous garden with wide lawns that are perfect for sports and games, a tree house and swing set, stone pool deck with sun loungers and umbrellas, breezy outdoor dining table accompanied by a BBQ, and the aquamarine pool with a special shallow area for little ones. 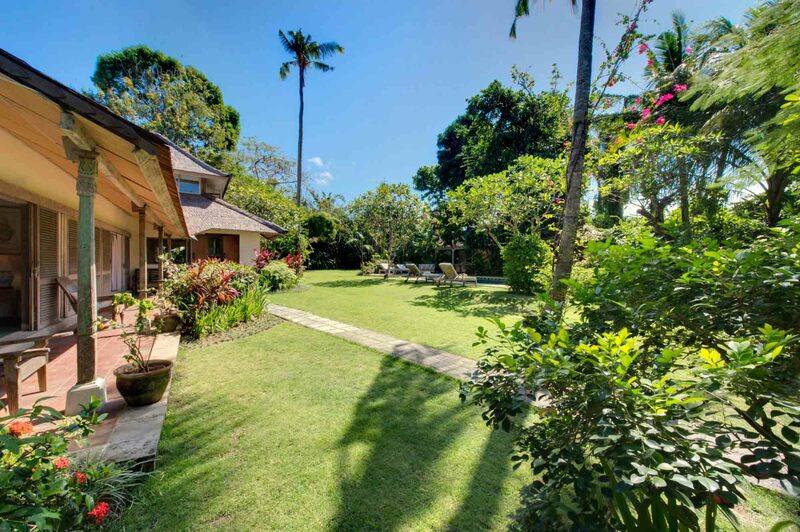 Across the lawn from the main building there is also a stand alone garden bungalow that offers the utmost privacy. 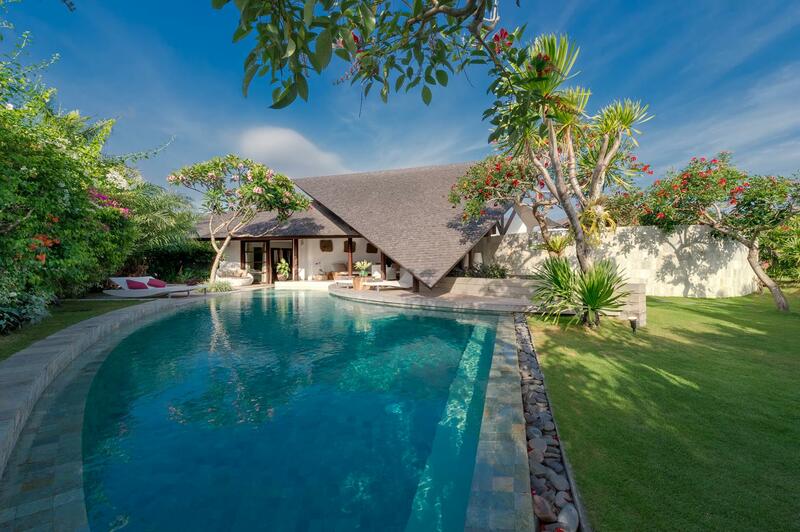 The bungalow has soaring ceilings, a king-sized bed, sofa, writing desk, patio with chairs, and a beautiful bathroom with a terrazzo tub and shower that open to a secluded garden. CAPACITY 8 adults, 4 children (3 king, 1 twin, bunk bed and 2 singles). 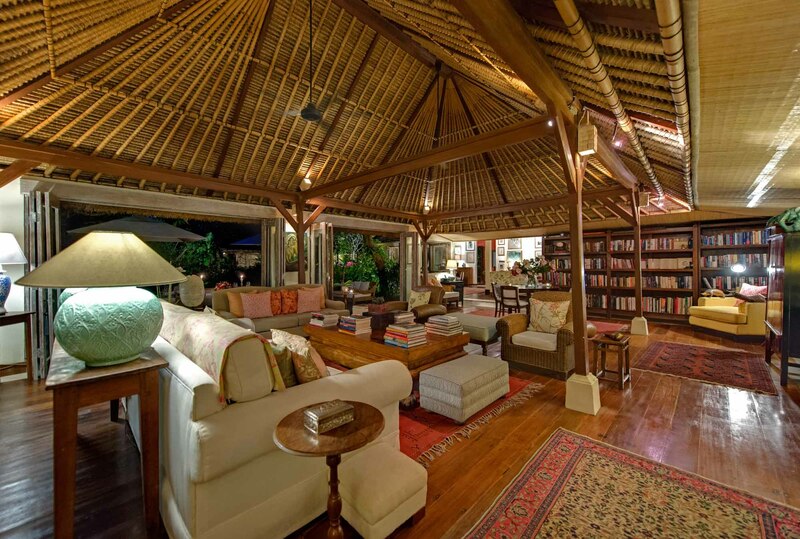 LIVING AREAS Open living/dining room, sitting room, media room, outdoor dining, upstairs library, large garden. POOL 13m (pool fence available). 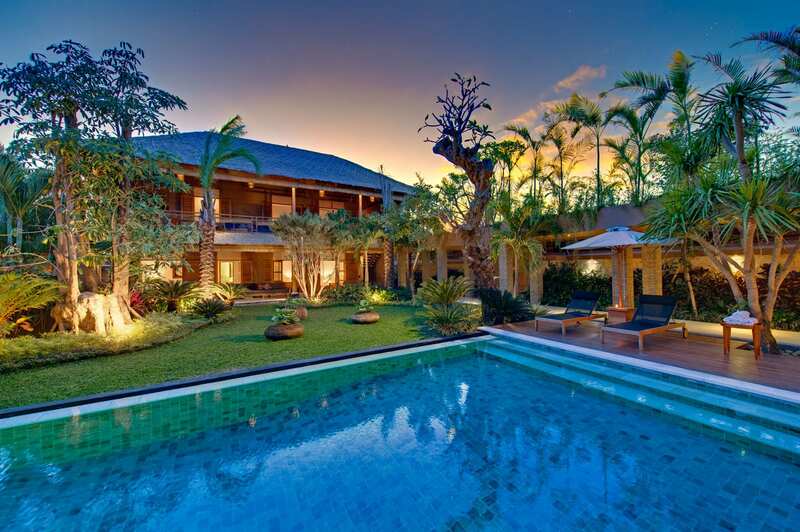 STAFF Villa manager, 4 housekeepers, chef, gardener/pool attendant, night-time security guard. Masseuse and babysitter on request. DINING Western, Asian, vegetarian and children's menu. Requests accommodated (including special diets). COMMUNICATION WiFi and ADSL internet access, landline for local calls and IDD, mobile phone coverage, desktop computer and printer/scanner. FOR FAMILIES 3 high chairs, 2 baby cots, baby car seat, bottle steriliser, pool fence. ADDITIONAL Safes, barbecue, backup generator. 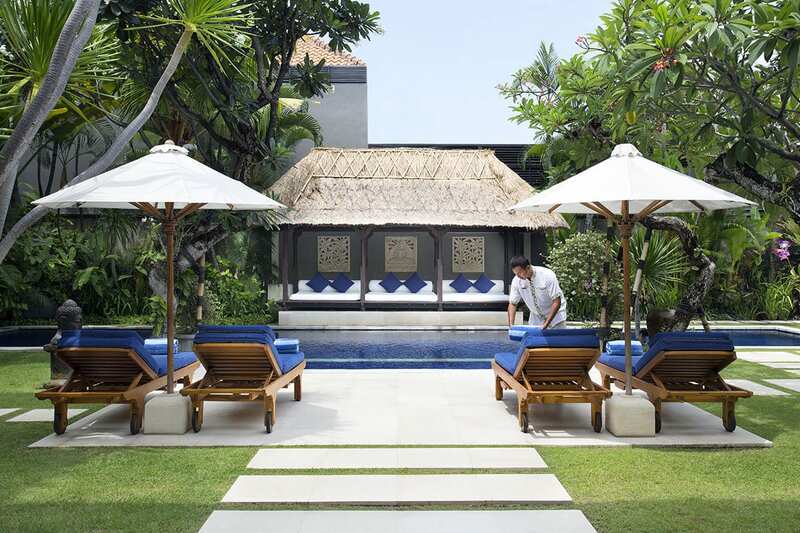 The Orchard House is tucked down a small laneway off Bali’s bustling tourist strip, Jalan Seminyak. 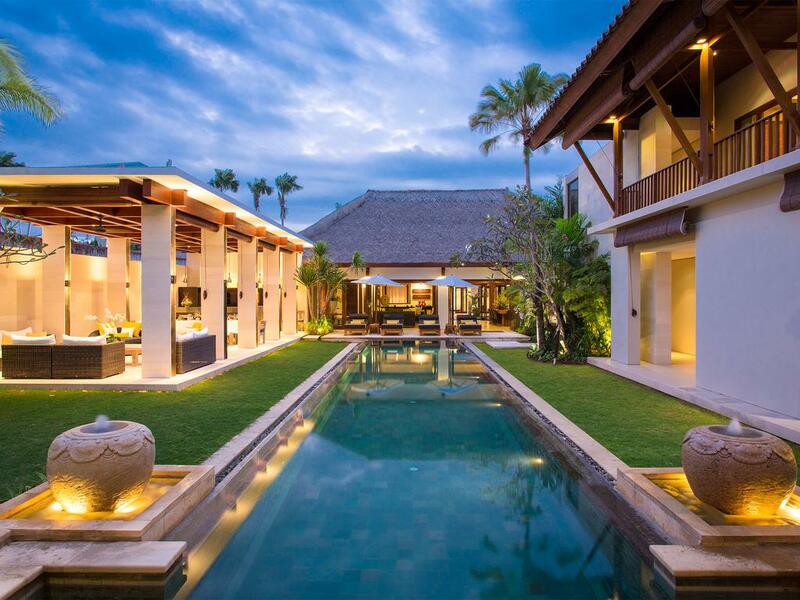 This lengthy street is lined with restaurants, bars, boutiques, galleries and spas making The Orchard House a food lover and shopper’s dream location. 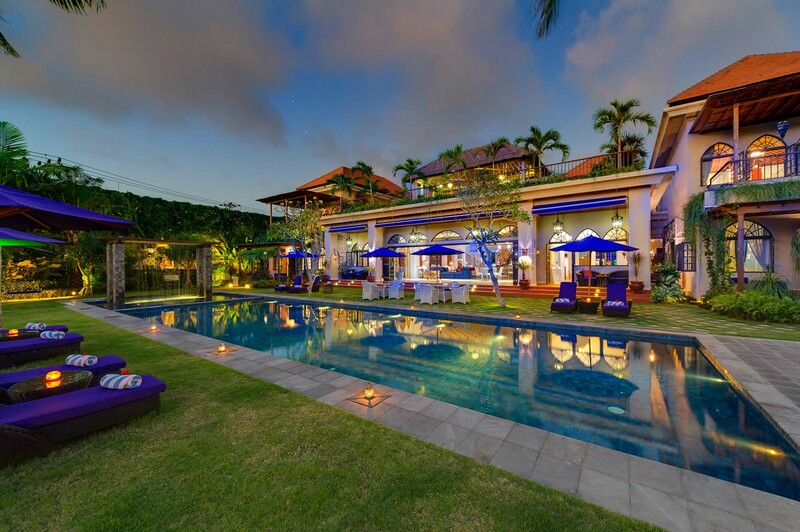 The villa is also just around the corner from Jalan Laksmana, or ‘Eat St’, where you will find every type of cuisine possible – Italian, Japanese, Moroccan, Indian and traditional Indonesian warungs. 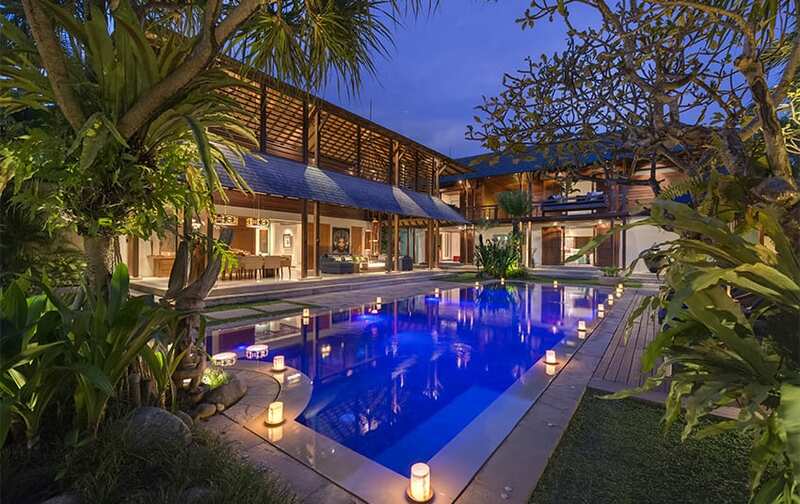 What makes The Orchard House so unique is that while it is in the middle of Bali’s most sought-after neighbourhood, it is also remarkably quiet and peaceful. 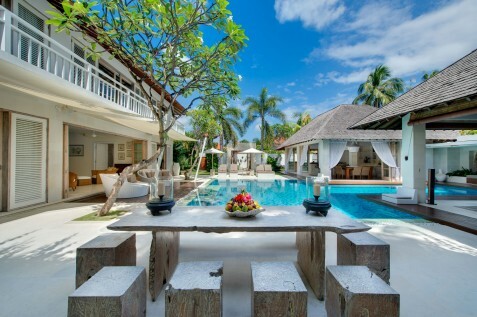 What a perfect place to stay. 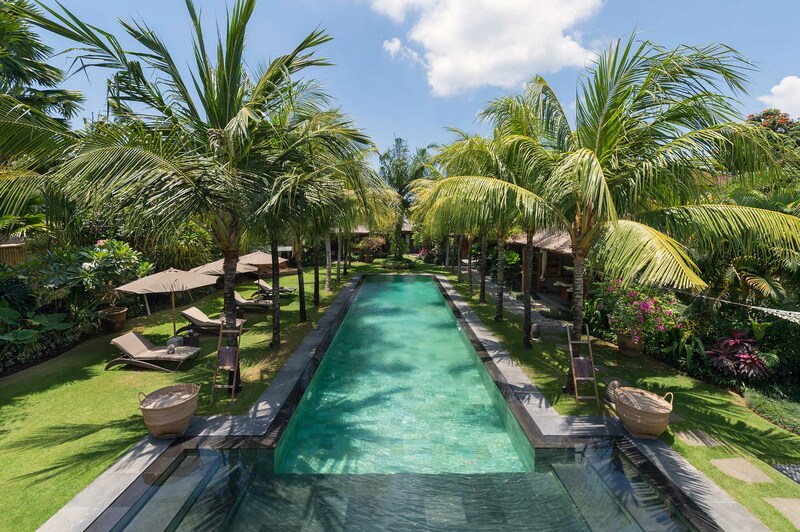 A tranquil escape from the hustle and bustle of Seminyak. The staff are amazing and nothing is too much trouble. So many toys and games for the kids!! Putu is a fantastic chef and seems to be able to cook anything. He makes the most amazing brownies!! The Orchard House was outstanding. 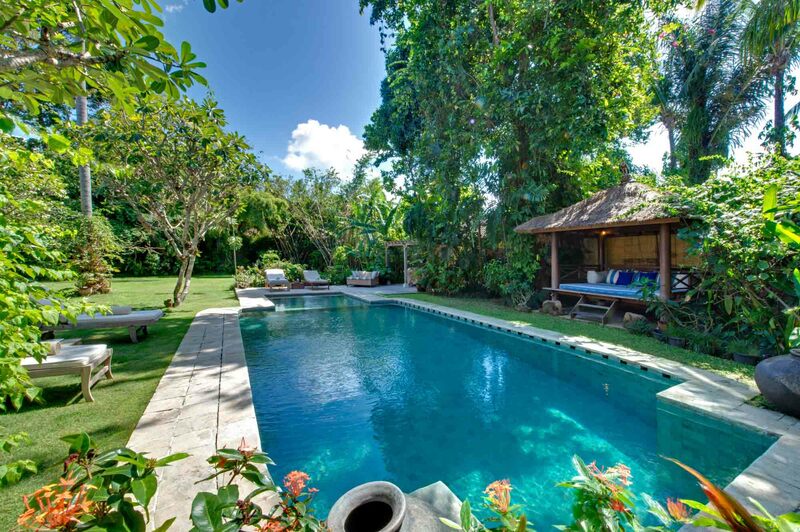 Great location and a real haven away from the noise and business of Seminyak. The staff were fantastic and the chef is incredible. Highly recommended. 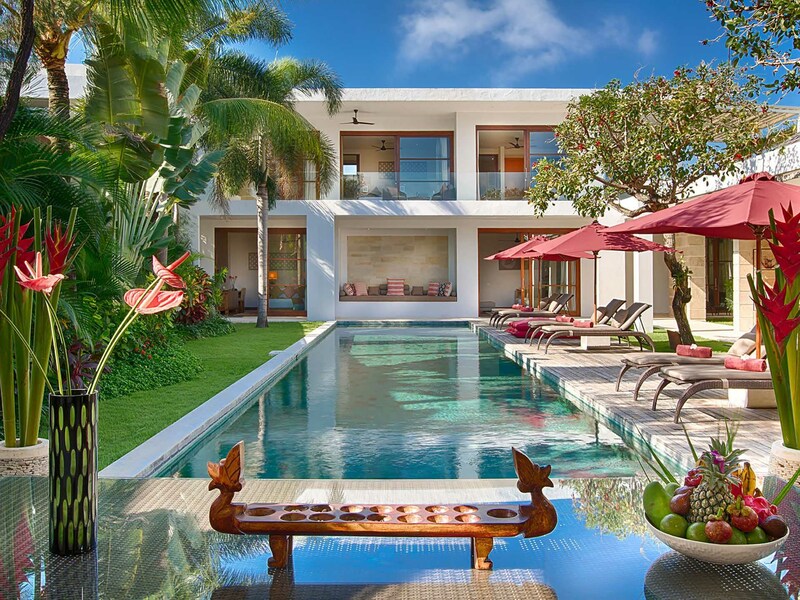 What a magnificent home! 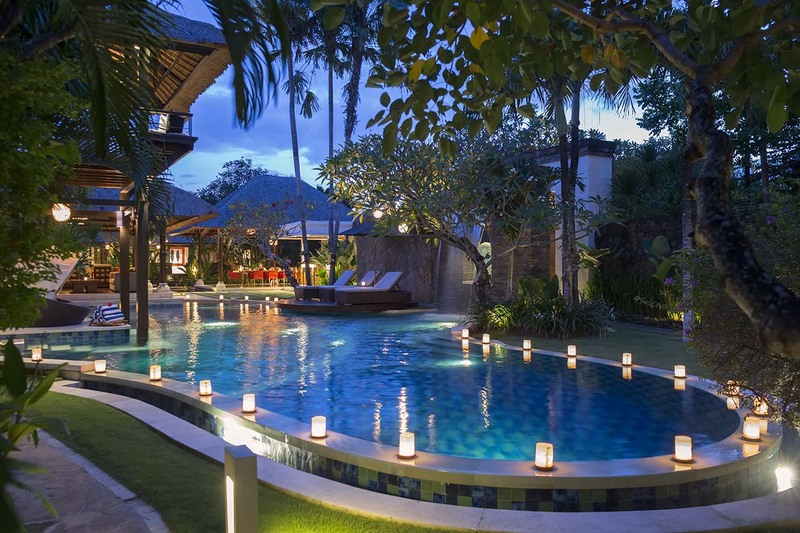 Walking down the little concrete alley and opening the gate to an absolute oasis. We all had the best holiday and the friendly staff ensured that. 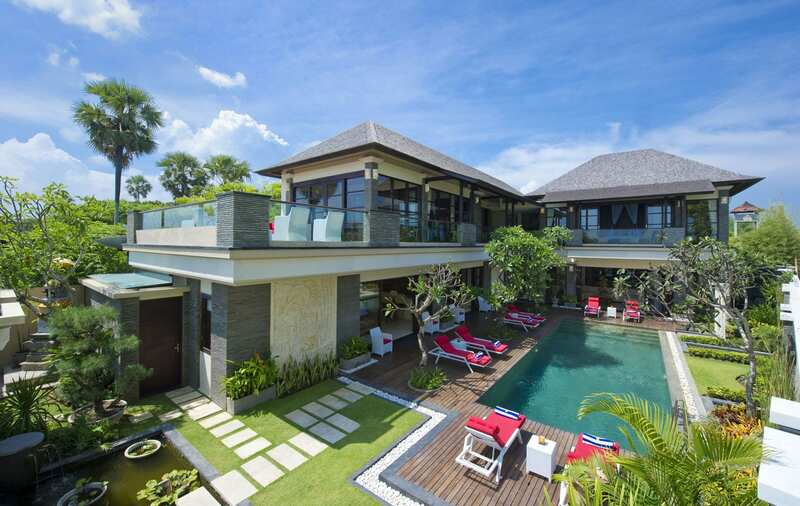 I couldn't recommend this holiday (villa) more highly for families. 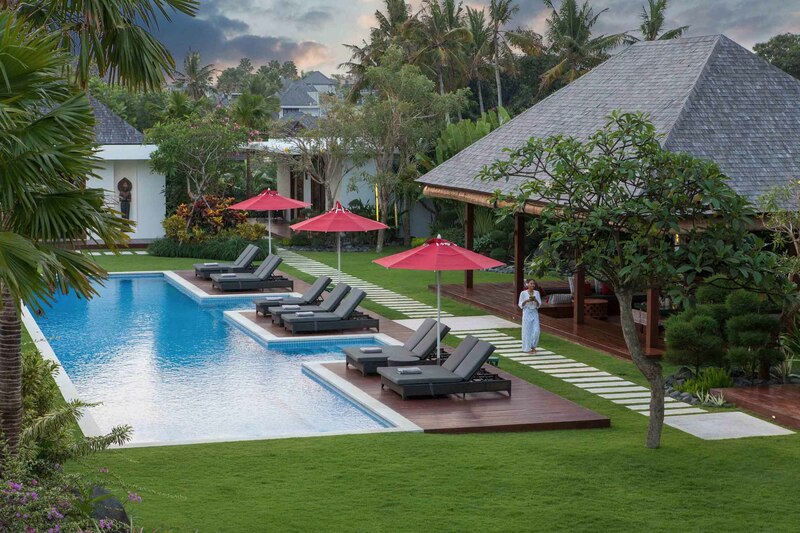 There was so much to do and see outside the villa and then we could just chill out and relax when we needed. We travelled with our five kids (the toys were so great) and my parents who stayed in the separate little house in the yard and it was just sensational. The home has so much character. And the chef, is just super, food for the kids then the adults and everyone is happy. The worst part of the trip was flying Virgin to get there. Had to pay for food on an international flight with no entertainment for the kids. I'd go back this today if the kids didn't have school. 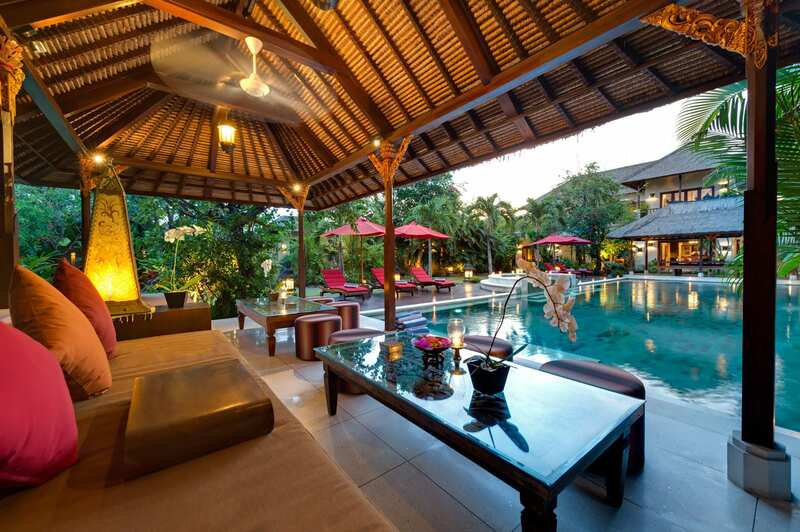 I have stayed at various villas in Bali and my holiday at Orchard House is by far the best. I was there with my family and we all had a wonderful time. 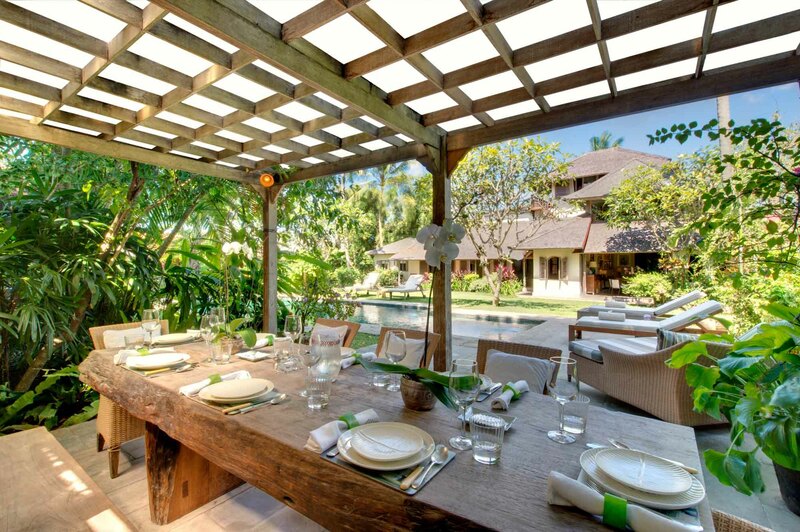 The villa was perfect for the children and the villa chef was just amazing. The staff was lovely and made our stay all the more enjoyable. 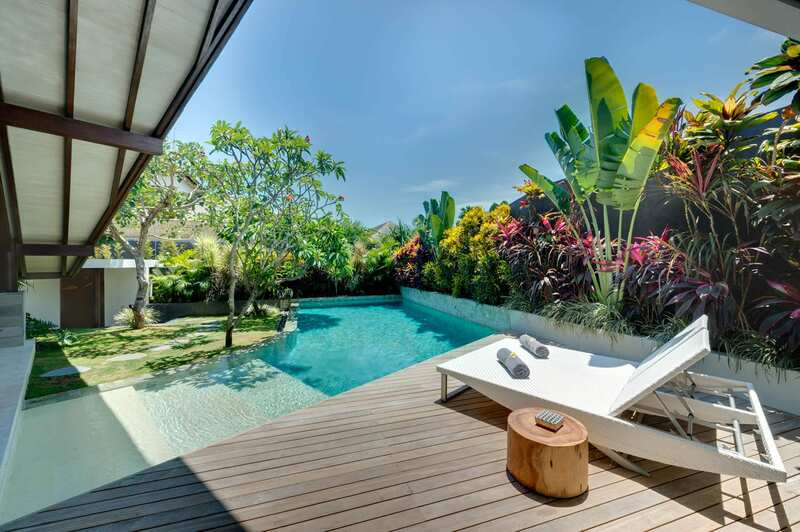 Artsy urban design and lush tropical living meet at Eshara Villa III, a chic hideaway just minutes from Seminyak Beach and some of Bali’s best boutiques and restaurants. 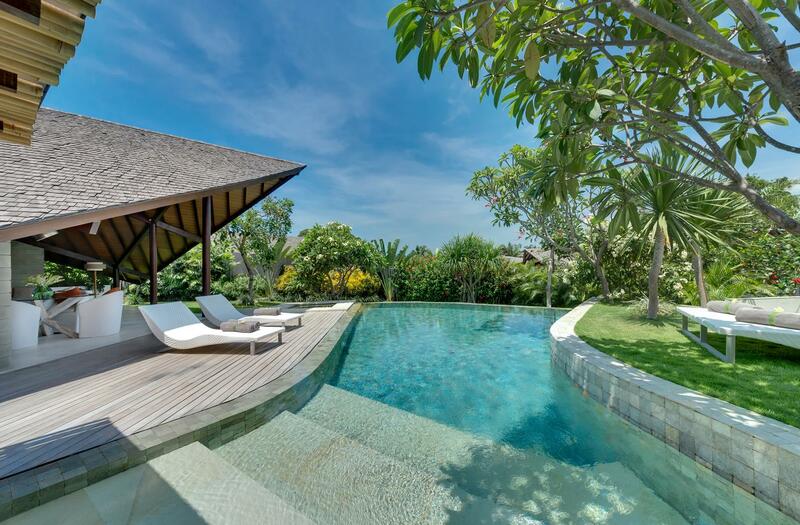 This luxury 3-bedroom private pool villa sleeps up to 6 Guests.